If you’ve decided to make the big move to New York City, you’re in for an exciting next few months. From finding an affordable apartment to learning how to operate the subway system, you’ve got your work cut out for you—and the last thing you want to do is make a mistake. One thing you shouldn’t have to worry about is finding a qualified, trustworthy New York City moving company. Finding the best moving company in New York City is imperative if you want your move to go smoothly. It should not be the last thing you do, and it should not be something you take lightly. With a population of 8.5 million people, New York City is full of packing and moving companies. Some of them are good, and some of them are subpar. But for your big move to New York City, you shouldn’t settle for “good enough.” You need to find the best moving company in New York City. It’s not so easy to find the best movers in New York City, and that means you need to be extremely cautious. Before you select a moving company, you need to do your research. You should know the qualifications all professional movers must have—and the qualifications New York City movers need to have, specifically. 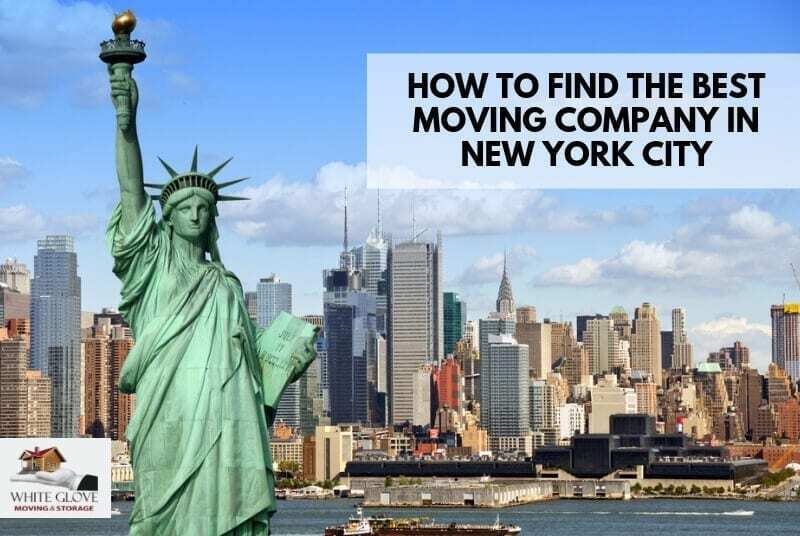 Read on for tips for finding the best moving company in New York City. They must be licensed in the state of New York. When you’re making your move to New York City, you do not want to hire an unlicensed moving company. All legitimate moving companies in the United States are required to be licensed. These licenses mean the moving company is approved to conduct business in the state and country in which they are accredited. If you decide to go with an unlicensed moving company because they seem less expensive or more convenient for your schedule, you are taking the risk of having your items damaged, lost, stolen, or even held hostage. A licensed moving company will ensure that your items are handled carefully and delivered without a scratch on them. When researching moving companies, make sure to check their website or ask a representative for information on licenses. They need to know their way around New York City. With its busy streets, bustling boroughs, and bright lights, New York City is widely known as “the city that never sleeps.” Moving in itself is stressful, but moving to New York City is known to be even more so. Your moving company should be intimately familiar with New York City. They should know the best streets to take, the best times to load and unload their trucks, and the safest ways to move your belongings. New York City is also known for its complicated street laws, parking laws, and street cleaning laws. Moving companies should be well-versed in these laws, especially when it comes to parking big moving trucks and blocking off traffic while your belongings are loaded and unloaded. The best moving company should be able to move your items quickly, safely, and legally when it comes to parking and street laws in New York City. They should be insured in the state of New York. With such a huge population, New York City sees a lot of moves, especially among young people who move from apartment to apartment fairly often. Landlords and property owners have seen it all—and that’s why they take steps to protect themselves from any damage that could be incurred by New York City moving companies. It is precisely because of these reasons that landlords and property owners often require a certificate of insurance (COI) from tenants’ moving companies. A COI is essentially a document that proves that the moving company is insured—a requirement that is extremely common in big cities. Any legitimate New York City moving company will be insured, and that means they should be able to provide you with a COI if you ask for one. If not, you should hire a different moving company that prioritizes insurance and safety. They should be able to pack, unpack, and set up your items. You could do the heavy-lifting yourself, but why do so when your moving company can do it for you? When moving in New York City, time is of the essence. Some landlords require that you do all of your moving in one day, or even have certain days of the week when moving is prohibited. A moving company can pack and unpack your items, load and unload them from the moving truck, and set the items up in your new home, which can greatly cut down on your moving time and stress. You can choose the amount of packing, unpacking, and setting up you want your moving company to do. Depending on the plan you choose, your moving company might pack up just your kitchen, or they might pack and unpack the entire contents of your home. Who said moving to New York City has to be stressful? They must have experience in New York City apartment moving. Moving in New York City is extremely different from moving in any other city. New York City architecture is extremely unique and sometimes very old. Consequently, apartments are often small and buildings are full of cramped hallways and stairwells. To put it simply, moving into a New York City apartment is way different than moving into a spacious suburban home. The furniture you are transporting from your previous home may not fit in your new apartment—it may not even fit through the doorway. The best New York City moving company will have extensive experience moving furniture and boxes in and out of high-rise buildings and multi-floor walk-ups—even if the apartment building does not have a working elevator. Some companies even have experience using cranes to lift heavy furniture and pianos in and out of skyscraper windows. With experience like that, there’s nothing they can’t move. They should take cleanliness seriously. Bed bugs, fleas, cockroaches, and other pests can wreak havoc on apartments and buildings in the big apple. And once you have pests in your apartment, they are extremely difficult to exterminate. To rid your apartment of these creepy crawlies, you could end up spending thousands of dollars on pest control services—which might not work the first time. To avoid dealing with bedbugs and other pests, it’s important to choose a moving company that is aware of pest control issues. The best New York City moving company will make cleanliness a top priority. Before you choose your moving company, ask them about the precautions they take to keep your items clean and protected from pests both during and after the move. They should have great customer reviews and references. One of the biggest benefits of having internet resources so readily available to us in this day and age is that we are able to research almost all companies we interact with. Many moving companies in the New York City area take advantage of the internet to present themselves as experienced, reliable moving companies—but this can sometimes be done dishonestly. Moving company scams are common in New York City, and if you end up being swindled by dishonest movers, you might overpay by thousands of dollars—or even get shaken down for money to get your items out of storage. In the case of New York City moving companies, you should do as much research as you possibly can. A good place to start is Google or Yelp, but you should also check with the Better Business Bureau and Ripoff Report. The best moving companies in New York City will have dozens of honest, rave reviews from real customers. They charge you a fair price for your move. Moving can be an expensive process, so it’s important to find a New York City moving company that is not in the business of overcharging for their services. Costs can vary greatly depending on the distance, schedule, and amount of items associated with your move. Most companies do not advertise their prices on their website, so you will likely need to call them or submit a form online to speak with a company representative. Because of this, it’s hard to know when you’re getting a fair price. Make sure to ask specific questions about mileage costs, packing fees, and other services—and be sure to get detailed answers. The best moving companies in New York City will offer a free initial consultation. The company will send out a representative to inspect your current apartment and the items you need shipped, which will help them determine the price of your move. With a free initial consultation, you know exactly how much your move will cost, and you didn’t have to pay an extra fee to get that information. A legitimate New York City moving company will not nickel-and-dime you while you are preparing for your big move. If you are planning a move to New York City, you need to put your trust, money, and priceless possessions in the right hands. White Glove Moving & Storage has more than 25 years of experience moving clients to, around, and out of New York City. Our licensed, bonded, and insured team knows the ins and outs of city living, and will take the time and care to ensure that your items are delivered on time and without scratches or damage. Contact White Glove Moving & Storage today to schedule a free in-home consultation and price estimate, or call us directly at 1-877-825-1596. Our professional team of New York City movers can’t wait to get you into your dream home in your new city.